Think you've about had it with picky eaters or being overwhelmed… and want to throw in the towel? Think traditional cooking just isn't worth it? If you're completely fed up or just having trouble, the fix is usually something very simple you can tweak or change. 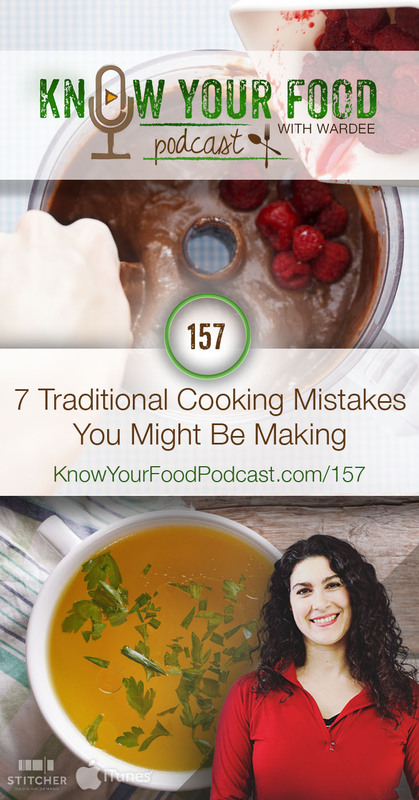 Take a look at these 7 common traditional cooking mistakes. Are you making any of them? If so, they're very easy to overcome (you'll see how below)! And… What common traditional cooking mistakes would you add to this list? Please share in the comments! These are common traditional cooking mistakes I see over and over (and I have made them, too). What would you add? Be sure to share in the comments! 1. Thinking you have to make everything all the time. You don’t have to do everything traditional cooking all the time. I mean, what would be the sense in that? What we cook and prepare can and should change with the seasons and what's a priority for our family's budget, health issues, or time constraints. Make it work for you, rather than being a slave to it! 2. Thinking it’s too complicated or overwhelming. Traditional cooking can be complicated, but it doesn’t have to be. Me? I don't do complicated. The way to make traditional cooking real in your life: take it one step at a time, prioritizing what's important and starting there. 3. Thinking it’s a lost cause because everything has to be soaked, sprouted, or fermented. You can’t do fast food anymore! Ok, this is so not true! You can make all sorts of “fast” meals and dishes with traditional foods. One example are our no-wait sourdough recipes. eggs — so many ways to fix them! “bowls” — a starch like rice or potatoes, meat, beans, and toppings — yumm! Another way to facilitate fast meals is through freezer cooking — keep the freezer stocked with meal components such as bread. 4. Thinking it’s not worth it. It will take time for your health and your tastebuds to transition to traditional foods and their flavors. You will not do things well the first time — it takes time to develop your skills. The natural, traditional way takes time, yet it's worth it! 5. Thinking you have to give up your favorite foods. You don’t! You can “makeover” nearly all your favorite recipes just by using quality, whole food ingredients. We have a lot of these recipes at recipes at Traditional Cooking School and inside our classes: spaghetti, meatballs, mac-n-cheese, cheesecake, hot cocoa, tacos, savory soups and stews. And… dare I say they are not only healthier, they actually taste better, too! 6. Thinking it’s hopeless if your spouse isn’t on board. To start this section, I want to share an over-arching idea. And that is, when we have conflict or differences with loved ones, to be like Mary: “She pondered these things in her heart.” What I mean is: ponder, wait, ask the Lord for wisdom on how to proceed. Don't spout off… approach the difficulties with calm. It's not that you can't address the challenge (though sometimes the Lord asks us to let go), it's that we should step back and think about the best way to approach it. Often, it comes down to delivery. Your husband is a grown man and responsible for his choices; you're not responsible for what he eats. Most people need to make slow, gradual changes. If he decides to give up junk food, fast food, SAD, etc., it needs to be his decision. He may never completely give up the junk food, fast food, SAD, etc., and you must be ok with that. Your relationship is more important than division over what he's eating. 7. Thinking it’s going to be too expensive. The truth is: you will spend more on food. However, you’ll spend less on the doctor, medicines — and once you being healing, you'll feel better. Feeling better, having more energy, getting more stuff done — that's priceless. Having said that, there are things you can do to reign in your real food budget and I talked about 8 ways to do that in Know Your Food podcast #141! Thank you,Wardee, for this on a night I’m particularly discouraged about it. When I feel so alone in these desires, it’s a blessings to have your weekly encouragement. Thanks for your thoughts on relationships too.